The Unbroken Circle performs at campus show. 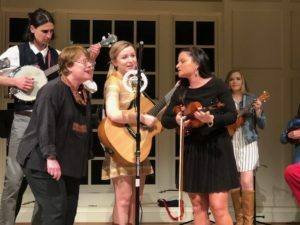 More than $28,000 was raised by the campus concerts presented Feb. 8 and 9 by the old-time string band The Unbroken Circle. Donations offered during the shows support the programs and initiatives of The Shalom Project. The Unbroken Circle is a Wake Forest-based muti-generational band. It has raised money for the project through performances in past years.